Matthias is a senior consultant currently working in the Digital & IT Strategy practice at Wavestone. He made the choice to get involved beyond the scope of his job description by taking a part in what is becoming a very French trend: skill-based sponsorship. This concept can be defined as follows: companies freely providing associations with the human resources they need to address their issues. In this way a company can sponsor social projects by giving them the opportunity to strengthen their offer with new services, develop activities abroad or elaborate a road map. In comparison with classic sponsorship, skill-based sponsorship only offers intellectual services and not financial assistance. This is a “people and skills donation”. 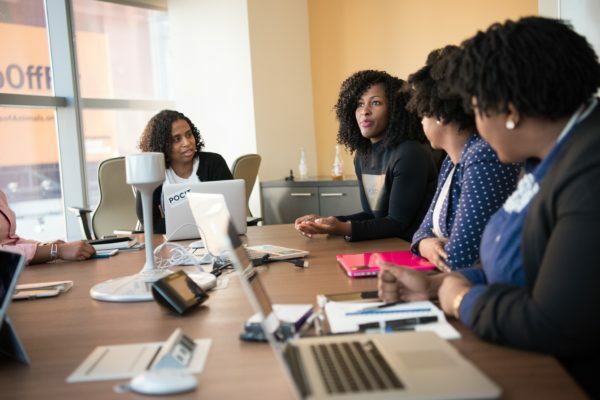 For companies, skill-based sponsorship has financial advantages but more importantly, it gives your collaborators new ways to get involved and build expertise. In this case, Wavestone is giving a chance for Matthias to work for the ShareIT program, the accelerator based at Station F. It aims at bringing technological expertise to social and solidarity business ecosystems. The association’s moto, Tech for Good, means “to provide the most promising social entrepreneurs with the technological means to develop ambitious digital solutions”. Matthias has been bringing his consultant skills to ShareIT by wearing multiple hats. As a true consultant, he has worked closely with the ShareIT team to help them organize and increase their efficiency. With the startups and associations, he has conducted projects using the Agile methodology (user stories, sprints…) and has brought his technological expertise to challenge the development teams and bridge the gap between developers and project holders. Thanks to Wavestone’s network, Matthias has been able to identify and mobilize a pool of experts to answer specific needs. While he is fully involved in the entrepreneurs’ projects, he also has to make sure entrepreneurs can keep on supporting their business on their own. Skill-based sponsorship and consulting: what differences? When asked about the main differences between his skill-based sponsorship activity and a more classical consulting mission, Matthias finds it quite hard to answer. In both situations you are expected to deliver the same service quality and that both positions turn out to be just as challenging and demanding. However, he has noticed that his sponsorship activity allows him to work with people with a totally different mindset. The ShareIT people and entrepreneurs tend to be more voluntary and benevolent, they are fully involved in the project as it is their own “baby company”. The projects themselves are completely different – user-focused and more technical. Compared to strategic missions conducted for corporate clients, Matthias told us he felt like he was doing something really tangible and with a real benefit for end users. Being part of the ShareIT program, Matthias works on different projects simultaneously. He gets to witness hands on the flourishing and maturing of multiple social entrepreneurs’ ideas. For instance, Signes de Sens is a French association aiming at making the world more accessible and inclusive to deaf people. It has entered the ShareIT program to develop a web plug-in so that when your come across a word on a web page, you get the immediate translation into sign language with a video. For now, you can access the Elix dictionnary which is basically the Google Traduction of sign language. The plug-in will be launched in spring 2019 with ShareIT, InTech and Wavestone’s help and involvement throughout the project. Matthias also presented us Everyday Heroes, a website which provides online first aid trainings in a fun and interactive way. With the technological expertise provided by ShareIT, the startup behind Everyday Heroes developed acompléementary application. Launched in December 2018, this application is an easy to use platform, with an offline mode and a progressive release system to keep you learning. Skill-based sponsorship and specifically Matthias’ experience plays a key part in Wavestone’s CSR strategy. The company has been eager to develop a consistent vision on that matter. Skills sponsorship might be a good way to keep up with those goals. Nowadays, companies are looking for ways to create more social value. As of today, 80% of big companies have launched their skills sponsorship programs. Young collaborators are eager to bring meaning to their professional activity, and 75% of people under 35 are ready to commit themselves in creating a more social and responsible eco-system. To achieve theses goals, Wavestone has set itself targets for 2021 such as being able to reach a 30 % part of women in the Executive committee. What’s more, implementing a skill-based sponsorship scheme is an asset for both collaborators and the company: better employee dedication, better reputation and image for the company, wider source of innovation and stronger value proposition. Incorporating skill-based sponsorship in its CSR strategy can prove useful to Wavestone and specifically to Shake’Up. Indeed, it provides another way for Wavestone to step in the associative world and to help tackle some of today’s biggest challenges. There is no doubt that Shake’Up, Wavestone’s startups accelerator, can truly benefit from this kind of sponsorship. Shake’Up is eager to develop a more responsible impact using startups as a leverage to tackle social and environmental issues. In particular, such partnerships can help Shake’up build expertise in social entrepreneurship. Since 2018, Isahit, a French startup has joined the Shake’Up incubator. As explained by CEO Isabelle Mashola, Isahit is a socially responsible outsourcing platform for digital tasks aiming at empowering young people in developing countries. It provides them with additional income that enables them to pursue their studies or start a business of their own. 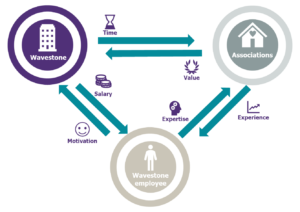 Wavestone’s ongoing and evolving CSR strategy is reflecting the way the world is changing. Development comes with sharing: sharing skills, sharing experiences, sharing means. Skill-based sponsorship is one of the many ways Wavestone intends to tackle some of the social and environmental issues we are facing. And needless to say startups are key to those evolutions. That’s why Shake’Up is digging into social entrepreneurship, accelerating startups eager to have a more positive impact on the world. Dans Acteurs et marché, Stratégie digitale, [Eclairage], mots-clés : Shake'Up, skill-based sponsorship.